According to the Royal National Institute of Blind (RNIB), nearly 4.1 million individuals in the UK will suffer from sight loss by 2050. Other research indicates that nearly 100 people in the UK start losing their sight daily. The stats are even scarier worldwide, with one person going blind every 5 seconds somewhere in the world. A leading cause of blindness is a bacterial infection leading to Trachoma. Because of the magnitude of the challenge, individuals and individual nations can’t act independently to prevent the spread of Trachoma. It needs a coordinated and concerted effort, from national and international entities, both in the government and private sector, to deal with diseases like Trachoma. Clearly, sight loss is an epidemic of epic proportions, and needs equally heroic efforts to confront it. Unless visionary action is taken now, the plight of the blind, and those destined to lose their sight in the near future, will worsen. Recently, the UK government announced an infusion of an additional £20 million as its ongoing contribution in the fight against blindness. The funding will go towards providing sight-saving drugs, like antibiotics to fight blinding infections, and for surgical interventions in 10 Commonwealth nations. One of the targets of these noble efforts is Trachoma – a bacterial infection that affects some of the most impoverished people in the world. Similar to many bacterial diseases, Trachoma thrives in places where there is inadequate sanitation, dearth of clean water, crowded living conditions, and an infestation of flies and other flying insects. Sightsavers volunteers and local distributors provide wash kits containing soap and hygiene advice donated by the World Health Organization (WHO) to help prevent the spread of the disease.ht loss is an epidemic of epic proportions, and needs equally heroic efforts to confront it. Unless visionary action is taken now, the plight of the blind, and those destined to lose their sight in the near future, will worsen. the infected individual blinks or bats his or her eyelids. As mentioned above, the good news is that, if detected at an early stage, many instances of Trachoma can be treated with antibiotics. In more severe cases, however, surgeons can prevent blindness from Trachoma through surgical procedures. At an international level, there is foresight that, if left unabated, Trachoma might be almost impossible to confront in a few years. The British government funding comes following a similar commitment of £360m pledge made earlier this year. The funds are earmarked to combat a number of Neglected Tropical Diseases (NTDs), including leprosy, sleeping sickness and, of course, Trachoma. NTDs form part of a collection of seventeen bacterial and parasitic infections, some of which lead to death, while others can cause life-long disabilities and physical impairment. Two of the more prominent NTDs, river blindness and Trachoma, cause blindness. The most vulnerable among a population at risk from NTDs are women and children. Preventable diseases like Trachoma have an even greater effect than simply causing life-long blindness. Individuals, particularly women living in traditional societies, are disproportionately affected by Trachoma. The resulting disability (from vision impairment or permanent blindness) can leave them marginalized, unable to take care of themselves, their children or their families. Children can also be severely impacted, leaving them unable to seek education or live healthy, playful lives. Young adults may also be deprived from seeking employment opportunities or earning a livelihood to take care of their families. When reaching epidemic proportions, Trachoma can be a drain on the meager resources of developing nations that are tackling other health crisses that pose even more immediate strain on resources. The added challenge of fighting NTDs like Trachoma, and then taking care of the life-long needs of those that succumb to it, can prove a Herculean task in many regions of the globe. Sightsavers work is changing lives in Senegal They assist people who are irreversibly blind by providing education, counseling and training. Very often, sovereign grants are seen to be used for geo-political agendas, and for other non-transparent purposes. However, in the case of one underdeveloped country, Malawi, the result of the fight against NTDs like Trachoma are plain – for everyone to see. According to the UK’s international development agency, barely four years ago, 8 million people were at risk of losing their sight to deadly Trachoma in Malawi. As a result of the heroic efforts made by professionals dedicated to wiping out the disease, today there is just a single such case left to eradicate. Malawians see the light at the end of the tunnel – thanks to the funding provided by international donors. There is even more hope. According to some research, scaling up efforts to tackle NTD can result in their elimination. All it needs is for nations to cooperate individuals and charitable organizations to accomplish the final goal: a world without blindness. According to Caroline Harper, the funds will be marshaled to make huge strides in the developing world, including Commonwealth nations like Mozambique, Uganda, Malawi, Pakistan, Tanzania and Nigeria, in eliminating the scourge of Trachoma. One such region of the world, where conflict and strife reigns supreme, is Yemen. The protracted conflict has seen the decimation of civil society, and the collapse of the nation’s infrastructure, including hospitals and water purification plants and waste and sewage treatment facilities. These are ideal conditions where many NTDs like Trachoma live, breed and proliferate. It is believed that over 2.5 million of the country’s population are at risk from Trachoma. In Yemen, there is still a lot more to be done on combating Trachoma, with over 2,000 individuals still living with the more advanced stage of the disease – trichiasis. However, clearly the efforts initiated by Sightsavers, in partnership with other governmental and private entities, is bearing fruit in that impoverished nation. According to Sightsavers, 75% of sight loss is avoidable or curable. While Sightsavers is committed to supporting global efforts to combat poverty, its central objective remains the fight against blindness. According to Ms. Harper: “At the core of everything we do are the people at risk of losing their sight and those whose sight is impaired or lost”. 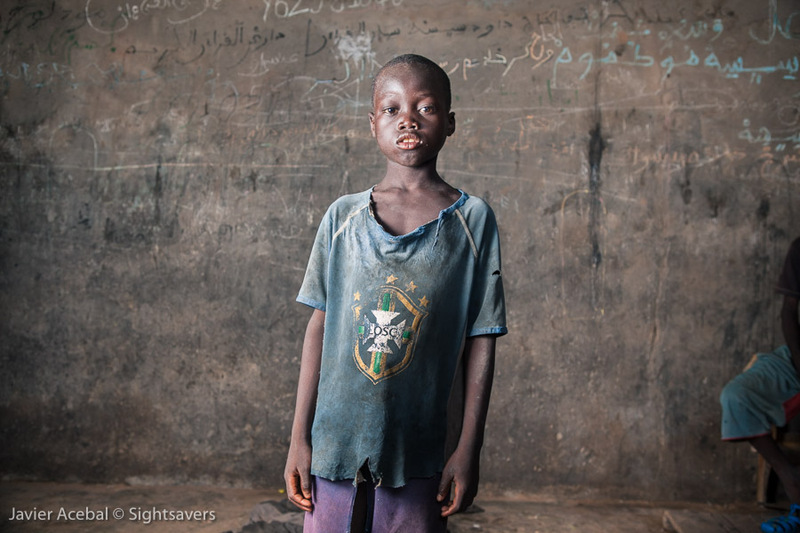 According to their website, Sightsavers is an international charity working to prevent avoidable blindness, support equality for people with disabilities, and advocate for change. But how the organization came about is a fascinating story by itself. No one could have imagined that a freak accident in a British school chemistry lab in 1931, leading to one student’s blindness, would be the catalyst to the founding of the British Empire Society for the Blind. But that’s exactly how events unfolded when founder Sir John Wilson, the school boy blinded by the accident, established the predecessor organization to Sightsavers in 1951. Sightsavers does this through national and international partnerships with institutions and organizations as diverse as the British Government, the World Bank, and private donors such as the Bill and Melinda Gates Foundation. Prominent members of the English Royal family like Princess Alexandra have supported Sightsavers since 1960. Fast-forward to 2017, and Sightsavers and partners have delivered over one billion treatments for NTDs, including Trachoma. This historic achievement was made possible by an extensive network of donors, partners, volunteers and local community distributors.